The Definitive All Dancing, All Complete, "WTF Happened to my nice list of integers in Elixir?" Post. Elixir. It generally starts like this. "WTF! where did my nice list of integers go?" expressions into a readable string. So lets look at the code that actually gets run when you type an Elixir expression in IEx that returns a List. def inspect(, _opts), do: ""
that nice list of integers separated by commas and surrounded by brackets that you were expecting. "Why does Elixir do this batshit transformation just because my list is small numbers?" one of the great strengths of Elixir. Elixir users get 20+ years of solid software engineering that is used to manage a large percentage of the world's cell phone traffic. This means that if the Inspect Protocol has tell you about Erlang error messages or strings returned from Erlang functions, it must convert any List of small integers into an ASCII string. Well, lets see what happens if we turn that transformation off. That's all very useful information. There are many Erlang functions that simply don't have Elixir aware wrappers to do the transformation from Erlang to Elixir strings. Now if we turn off the nasty :infer that destroyed our beautiful list of integers, what happens to all that useful information. That's terrible, what do all those weird lists of number mean? Now imagine you got an error message that was just a list of integers. It really seems like there should be a way to straighten this out, but unfortunately all the solutions are worse than the problem. However, once Elixir Golf becomes a thing ( and it's just a matter of time) , you will be able to turn that nastily long list of integers into a cryptic string and your code will still work. And finally for those that have made it this far, some real dancing. Additionally, you can put that Stream in a variable and use it anywhere in the program. As long as the underlying file does not change, the values of the enumeration will not change. A File.stream always enumerates through the whole file each time it is evaluated. Pipes are one of the features that draws programmers to Elixir, but like anything good you can always over do it. Readability and maintainability should be the first goal. I'm not sure where the exact limit is, but I am sure that pipes can be abused to make code very difficult to reason about. My personal limit seems to be about 3-4 in a sequence. Coming from a Ruby background it took me a while to wrap my head around what Stream and Enum really are. It's far too easy to think about them as a generalized version of a Ruby Array. At their heart, they are both tools for composing functions. that allows you to operate one at a time on members of the collection. Elixir Enum looks quite different at first. It requires that the collection implement these basic functions. None of these looks like an "each" method. collection into another collection. You can use this "dynamic" collection anyplace you can use a regular collection. Where module is a Atom. All module names are Atoms. Code.get_docs returns a list of tuples describing the attributes of each of the functions exported by the module. The initial tuple is the function name and arity. line is the line of the source file on which the function. kind is an atom that describes whether the exported function is a macro or a function. the markdown documentation for the function. If you're willing to fudge things a bit you can duplicate the parts of this function that the iex h command uses by parsing erlang man pages. Every erlang module supports the function module_info. the Erlman project on github. Unfortunately, this is kind of a dead end since it's not general enough to be included in the main elixir source code. It requires that the erlang man pages be installed and that is simply something that can not be counted on. It's also unclear if the current version will even work on Windows with the man pages installed. My next thought is "Is there a hook into iex commands that I can use to make this an optional addon?" If we have Erlang installed, the man pages must be there somewhere. And of course one of the tenants of Iex is that any functionality should be available in the Windows version if at all possible. While creating a command to shell out to erl -man would be simple, it wouldn't be portable. Erlang installs it's man pages in a separate path to avoid conflicts with the standard unix man pages but puts them in the standard man/man3 locations. The convention is that the man page for an Erlang module is the Erlang module name followed by section number. The standard Erlang functions are documented in the erlang.3 man page. So my next step was to reimplement erl -man in purely Elixir code. The first part went really quickly, finding the man page for a given module was relatively straight forward. We just find where the erl executable is and work backwards from that to find where the erlang man pages are and then search for the module name. After that I implemented a very simple-minded man nroff macro to markdown translator and was able to display an Erlang man page from the iex prompt. During this process I noticed that the Erlang man pages use a very consistant, small subset of the man nroff macro package. This lead me to believe that it would be possible to extract the specific function documentation from the man pages. It turns out that Erlang documentation is maintained in XML and translated by an xmerl based program into both man pages and html documentation. Unfortunately, this XML source is not included in the default binary distributions of Erlang. Unix versions get the man pages ( and html usually ), but the Windows distributions only get the html. Parsing the html is a lot more complicated that dealing with the nroff and there are no HTML parsers in the standard Elixir libs. Ports are gateways between the Erlang VM and external codes and processes. The Erlang VM is sensitive to code "hanging" in any fashion and Ports need drivers that are aware of how to interact with the Erlang VM safely. However I was unable to find any clear documentation of just what drivers are available and the examples I found were inconsistent. The types and drivers are documented in the man page for erlang in the open_port section. I did however find the Porcelain Elixir module that is both well documented and very straightforward to use. Having taken this long to get back to this, I'd just as soon go on to the actual benchmarks. you can use the same Dave Thomas hack for creating many tests that iterate over a list of values. Benchfella runs each test for as many times as possible in a given interval ( the default is one second ) and returns the average time per test over that interval. Data from each run is stored on the filesystem so you can do comparisons between runs. 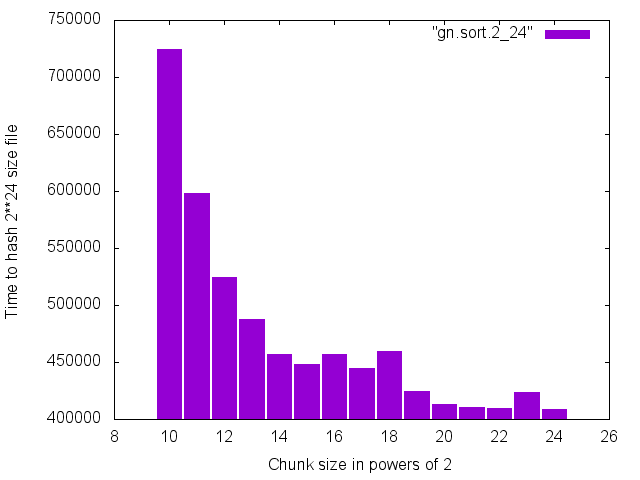 The plot below shows the results from using a chunk size in powers of 2 from 2**10 to 2**24 to hash a file of size 2**24.
was done on a MacBook Pro with 16gig of memory and an SSD disk drive. This shows that using large binaries in Elixir ( and Erlang ) is generally the fastest way to deal with large data sets. Of course you need to make the tradeoff between total available memory and the number of binaries you want to process at a time. computing it's hash. The simple read method was consistently twice as fast as the single chunk method. In my previous post I outlined how to get a cryptographic hash of a file using Elixir. For large files, you want to chunk the file rather than read the whole thing into memory, it would be good to determine if there is an optimal chunk size to use to for passing into the encryption functions. |> :crypto.hash_final |> Base.encode16 "97368E46417DF00CB833C73457D2BE0509C9A404B255D4C70BBDC792D248B4A2"
The first step in doing this is to create test data files of a specific length. An obvious approach is to simply open /dev/random and read until you've got enough sample data. A simple shell example. That sure looks like a bug, /dev/random is not a directory, but a char special device file. While the error message is misleading, there is no actual bug. Erlang will not open files for reading that it considers dangerous to the overall scheduler. In this case, /dev/random is a character special device file and since these kinds of files usually block on I/O, Erlang errs on the side of caution and will refuse to open the file. There is an exception in the Erlang code for /dev/null since that is considered safe for the scheduler. This post goes into the details. There are several ways to get around this problem. The first solution that springs to mind is actually one of the more difficult ones to do in Elixir. In many languages there is a system call that you can use to execute shell commands. Elixir has System.cmd, but it is relatively limited. You can specify the command to execute and the argument list, but you cannot use shell based I/O redirection. The most straightforward Elixir solution is to use the rand_bytes function from the Erlang crypto library.